15:45 MSK: RT ends its live feedback on Saturday’s protests in Russia. Have a nice day! 15:37 MSK: Around 20 people who attended various rallies in Moscow sought medical attention for hypothermia. 15:06 MSK: Police officials say around 175 thousand people attended rallies in Moscow on Saturday. According to their data, 36 thousand were on Bolotnaya Square and around 135,000 on Poklonnaya Hill. 14:46 MSK: Next opposition rally to be held on February 26th, according to organizers. 14:43 MSK: Rally on Bolotnaya over, people are slowly leaving the square. Organizers say at least 120 thousand people attended, while official police estimates put the numbers at 38 thousands tops. 14:04 MSK: According to police data, around 100 thousand people are attending the pro-Putin rally on Poklonnaya Hill. 13:55 MSK: Rally on Bolotnaya begins with people still flocking to the square. 13:37 MSK: As more people are arriving at Bolotnaya Square, which is situated on an island at Moscow River, police have deployed hovercraft. They are patrolling on the frozen river. 13:20 MSK:Observers by metal detectors on Yakimanka Street say at least 50 thousand people have passed through on their way to the rally. Police estimates are significantly lower at 23 thousand participants. 13:08 MSK:First group of protesters arrive on Bolotnaya Square, thousands more following. 12:57 MSK: Liberal Democrat rally over. 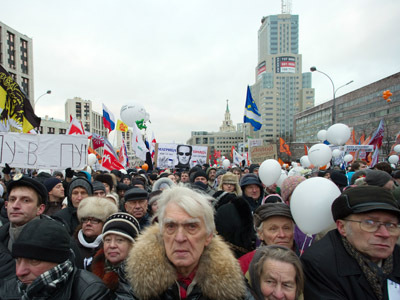 Bolotnaya Square open to protesters. Presidential candidate Mikhail Prokhorov has arrived at Yakimanka Street with some of his supporters. The Moscow Metro is having trouble accommodating all the people passing through stations closest to Yakimanka Street and Poklonnaya Hill. It’s like a special Saturday rush hour. 12:45 MSK: Latest turnout estimate by the police: 11,000 marching at Yakimanka, 35,000 at the Poklonnaya rally, 1,000 at Pushkin Square. 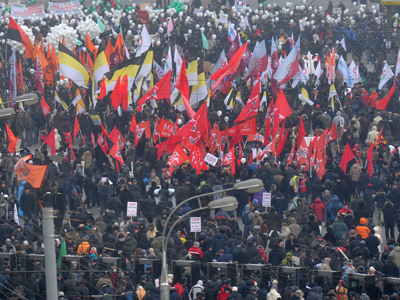 Organizers of the Yakimanka march claim a higher turnout of 12-15,000. Protesters in Yakimanka are displaying their creativity. There is a “human tank” among them wearing a cardboard turret over his head bearing the slogan, “tanks are not afraid of filth.” A giant crocodile is being carried on sticks by half a dozen protesters. Police halt the flow of people onto Yakimanka Street for five minutes to prevent crowding. 12:31 MSK: The Poklonnaya Hill rally, which is scheduled to start in some 30 minutes, has attracted 15,000 people, according to police estimates. 12:31 MSK: The Liberal Democrat rally in Pushkin Sqare has 500 participants, police report. 12:31 MSK: Media estimate the number of people on the Bolotnaya march at 7,000 so far. 12:20 MSK: Protest march starts. Demonstrators carry banners displaying anti-government slogans and sing a popular 1980s song by Viktor Tsoy demanding change. The song was one of the emblems of the Perestroika era. 12:19 MSK: ­Police have set up 32 walk-through metal detectors at Yakimanka Street, the starting point for the march to Bolotnaya Square. 12:16 MSK: ­Moscow police are deploying some 9,000 officers on Saturday. They are to maintain public order and ensure that all the events pass off safely. 12:12 MSK: ­One of the key factors affecting the rallies will be the cold snap, or “General Moroz”, as it is jokingly called. The wave of extreme cold, which has seen temperatures dip to -20 degrees Celsius, could affect the turnout and pose a health risk to those taking part. 12:08 MSK: ­Several presidential candidates had originally planned to deliver speeches at the rally, but later changed their minds. Businessman Mikhail Prokhorov said he would attend the event, but only in a personal capacity. Lib Dem leader Vladimir Zhirinovsky has organized its own rally, scheduled for the same time. Sergey Mironov of Fair Russia decided not to attend. Community leader Gennady Zyuganov is out of Moscow on Saturday. 12:06 MSK: ­The “Fair Election” movement has organized a march in central Moscow which is expected to end with a 30-minute rally at Bolotnaya Square, which in December was the scene of one of the biggest opposition demonstrations seen in modern Russia. Protesters angry at what they saw as a rigged parliamentary election are coming back to demand, that next month’s presidential poll is free and fair. The rally is being called “For Fair Elections!” Between 20-30,000 people are expected to turn out. 12:03 MSK: In Russia’s Far East and Eastern Siberia, a series of events have already passed off peacefully. 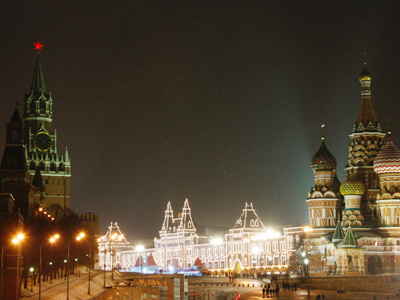 But the main focus today is on Moscow’s two rallies, which are expected to draw the largest numbers. 12:01 MSK:There are a range of views being expressed as the election date approaches. Some are throwing their weight behind a particular presidential hopeful. Others are raising their voices against the political situation in the country. Yet others fear Russia is being dragged into chaos, as has happened in some Arab Spring countries. 12:00 MSK: Hello! It’s Saturday, February 4. Exactly a month from now Russia is to elect its new president. Today sees a number of political rallies across the country and even abroad. RT will be broadcasting regular news updates and keeping you informed through Twitter, Facebook and its website.